Function Various → waterfront park, port facilities, commerce, business, etc. Simultaneous development of the port and the surrounding areas is needed, especially the former downtown area which used to be the dynamic and vibrant in order to revitalize heart of the city. 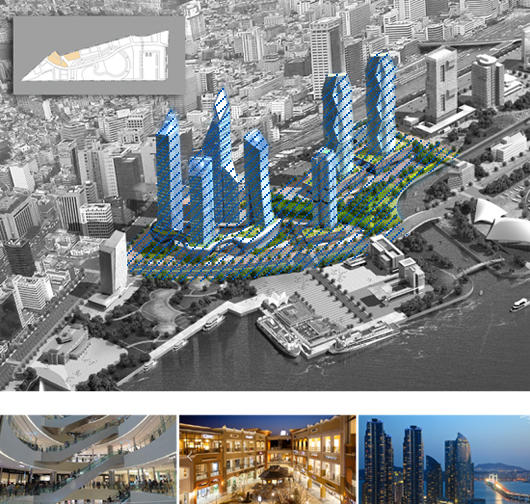 Stimulate stagnant local economy and revitalize Busan through integrated development of the port and former downtown areas. Busan North Port, situated at the pivotal point of the southeast coast tourism belt in Korea, serves as a key gateway to the Eurasian continent as it is located closely to the KTX Busan railroad station, which are day serve as the terminus for trains from Europe and Asia. 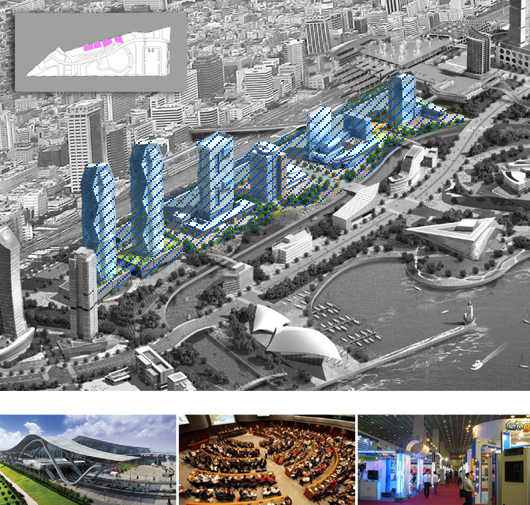 The area where the port is being redeveloped has great potential as it will be encompassed within a commercial district, according to Busan City's urban plans for the year 2020, and is also adjacent to central commercial zones in Busan such as Nampo-dong, Gwangbok-dong, Jagalchi and the 2nd Lotte World skyscraper currently under construction. 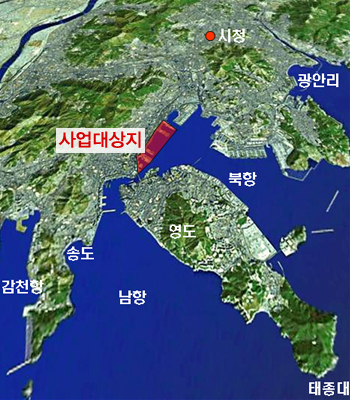 With Busan residents' high expectations for it, political and social attention is being centered on the project, which is expected to contribute to the revitalization of the local economy. 01. Offering a gateway to the Eurasian continent and the Pacific, cementing Busan's status as an international gateway. 02. Securing the city's status as an international marine tourism city by developing the waterfront to international standards and at the same time providing residents with a variety of waterfront urban spaces. 03. Revitalizing the heart of the city and the local economy through the simultaneous development of North Port and the surrounding areas. 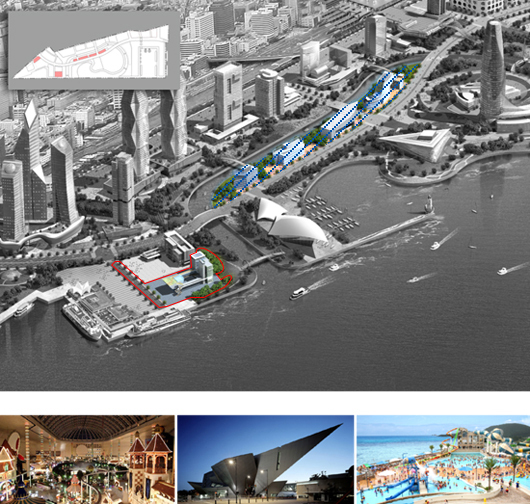 The Busan North Port redevelopment concept is subdivided into the following three concepts. 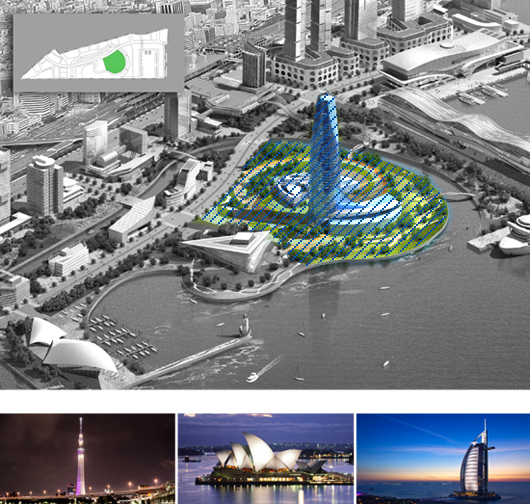 City Design Concept: Rising sun, dynamic waves, soaring sea gull symbolizing opportunity, a new beginning and the city taking hight as an international city. The Commercial Business District is a highly accessible business area located between Busan Station (KTX) and the International Passenger and Cruise Terminal. It has world-class shopping malls, finance centers and hotels. The area has been built to maximize the number of businesses and functions in the district. We created the district as a joyful place full of visual and media contents. In addition, we have established various media outlets, such as broadcasting, plays, and animation movies in order to offer pleasure and maximize the relationship between the area’s businesses. 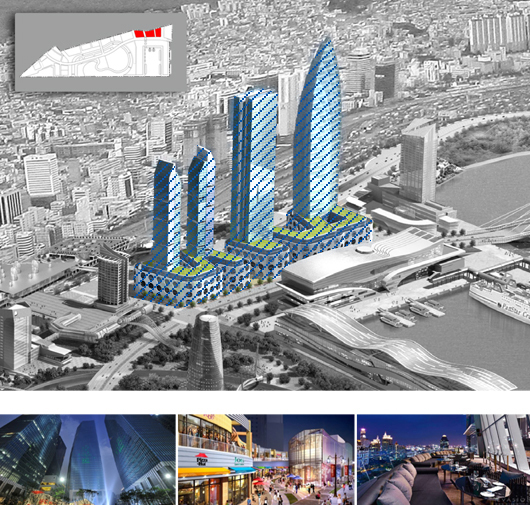 As the most symbolic district with concentrated office buildings, we want to make this area into a landmark that revives the local economy in order to foster the district, which attracts the most Busan citizens and visitors throughout the year. We plan to construct an open space with canals and large-scale waterfront parks in order to make a cultural district that represents the city, by harmonizing tourism, leisure sports, culture and art within the space. We seek to provide a new form of urban waterfront residential space by linking up the waterside area and marina facilities, in order to prevent the doughnut phenomenon. 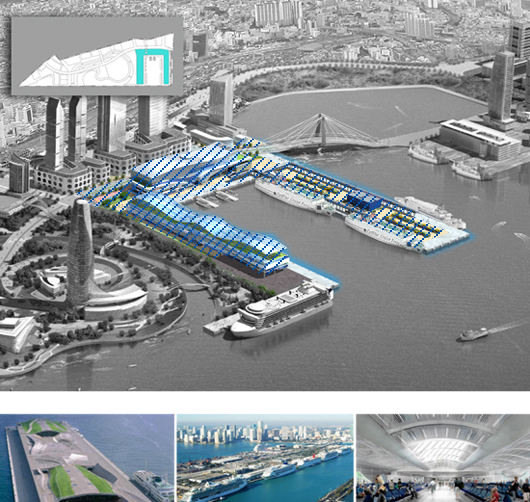 We aim to link up the passenger terminal, a gateway of marine transportation that accounts for most of the demand in The Republic of Korea with the Commercial · Business District in order to make a multi-purpose Port District for international exchanges and create a synergistic effect between commercial and business functions.